A profile of the Pattison family can be found here. On a visit to the Glasgow Necropolis, after crossing the Bridge of Sighs, go left and then take the first path on your right. Some distance along this path you will see a full sized statue on a large plinth. This is the site of the Pattison family enclosure. 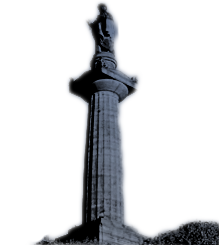 The statue is of Lieutenant Colonel Alexander Hope Pattison, who died in Nassau in 1835 at the age of 48 years. He was a brother of Granville Sharp Pattison. There are many memorials, etc., to study but I will only refer to two. yard and deposited them with their mother’s in the vaults beneath. Adam Monteith Pattison, died 1 August 1864 aged 37 years. died 13 February 1897 aged 78 years. Granville Sharp Pattison was born 1791 and educated at The Grammar School and The University of Glasgow. He became a member of The Faculty of Physicians and Surgeons in 1813, and established The College Street Medical School at 10 College Street, together with Andrew Russel, a co-accused at the Grave Robbery Trial. Respectively they taught Anatomy and Surgery. Pattison also had an Anatomy Museum. In the summer of 1813, at the age of 40 years, Mrs Janet McAlister, nee McGregor, a renowned beauty and mother of 8 children, fell whilst on holiday in Helensburgh, injuring a hand and toe. She later died at home in Glasgow on 8 December 1813 and was buried on 15 December 1813 in the centre of the New Ground of the St. David’s Church Graveyard late that afternoon. Early next morning the gravedigger, Henry Baird, returned to complete the burial discovering that the grave had been violated, and save for the grave clothes, the coffin was empty. He immediately notified the appropriate authorities. It was noticed that there was a trail of mud and footprints over the graveyard wall and in the direction of College Street. (The is was possibly Inkle Factory Lane, since College Street was not extended so far until 1847). At this point Mrs McAlister’s husband, Walter, a Wool Merchant, does not appear to be involved, but later he campaigned tirelessly to get a conviction in this case, and personally approached the Lord Advocate. Her two brothers, James and Donald McGregor, presumed that the body had been taken to the Medical School in College Street and applied for a search warrant. This was received by mid-day, but it did not include entry, which should be carried out by an official of the Court. Therefore a group of people went to the Medical School, and knocked and banged the door for more than 15 minutes before an attendant, who said he had not heard them at first, opened it. A search was now made, noting that Granville Sharp Pattison, Andrew Russel, together with Robert Munro and John McLean (the two students who were also charged) were in the room. The search revealed several bodies and parts of bodies, earth covered spades, wet clothing and bags big enough to hold a body. At this point a porter began to collect various body parts in an attempt to complete one whole body in the presence of Dr John Burns, Professor of Surgery and Midwifery at the Anderson College. This proved to be a gruesome task as so many pieces were scattered in various vessels around the room. The investigation continued for the rest of the week, in which time a scarred hand and a foot with a black toe were discovered and later identified by Mrs McAlister’s two sisters-in-law, who had cleaned her body before the burial. Pattison was arrested, examined by a Glasgow magistrate, and made a signed declaration. He was bailed on the sum of £100, Robert Munro and John McLean also signed declarations and were bailed on the sum of £30. Several weeks later Pattison was recalled by another magistrate and signed a further declaration. On both occasions he declined to answer any questions relating to Mrs McAlister. Russel was examined by a third magistrate and also signed further declarations, but declined to answer questions relating to Mrs McAlister. These declarations were read to the jury at a preliminary trial at the end of the Crown evidence. The four were then indicted to stand trial at the High Court in Edinburgh, being released on bail. John Clerk, for the accused, moved that the trial be held behind closed doors on account of the gruesome nature of the evidence. The judges denied this by a majority, although the Lord Advocate announced that no newspapers were to publish the evidence given. Evidence for the Crown included a medical report from three doctors and a surgeon, plus an account by Mrs McAlister’s dentist as to dentures he made that fitted one of the heads found in Pattison’s rooms. Janet Grey stated that at 10 pm on 15 December she was guiding, by lantern, a visitor at her home in George Street, and when in College Street she heard voices in Inkle Factory Lane and saw people carrying a bundle. When she returned home she told her husband, James Bruce, a Police Officer, that there was “evil about”. Evidence was then led for the accused in support of their alibis for the night of 13/14 December when two doctors stated that the dentures fitted four other found heads equally well, and that the uterus of the body in question was non-parous, whereas Mrs McAlister had eight children. After the Trial ended at 2 am on Tuesday 7 June 1814, the Jury were ordered to give their verdict by 2 pm that same day. A signed unanimous verdict was presented at the appointed time, finding Andrew Russel and John McLean “Not Guilty”, and Granville Sharp Pattison and Robert Munro “Not Proven”. Lord Justice-clerk Boyle addressed the four accused and discharged them. To Pattison he gave a warning that he should be careful and circumspect in his profession, avoid all suspicion, and not to place himself in a similar situation again. It was obvious that Mrs McAlister’s body had been raised by someone, and the body or parts of it were found in Pattison’s dissecting room. However, although Pattison must have been aware of the grave robbery, he took no part in the removal, and was justifiably found Not Proven. It was also obvious that there was great confusion in the assembling of the body from the parts found in the search, and that the wrong trunk was fitted to the head. It is questionable as to which remains were actually re-interred in the McGregor family grave.